The clear indication of fire exits is important in any building to first and foremost ensure workers and visitors can leave the premises safely in the event of an emergency. Such practice also ensures that relevant health and safety guidelines are met. Fire exit right signs clearly display the route to take to the nearest fire exit. They are available in a range of sizes and materials to suit any location. See our guide to sign materials for more information on each. Compliance with health and safety regulations is what Seton specialises in, and awareness of the appropriate fire exits and actions to take during the event of a fire or other emergency evacuation can be achieved, in part, through the correct choice and placement of fire exit signs. Fire exit right signs denote the location and direction of the nearest fire exit to workers and visitors, enabling them to get to safety in the event of a fire. What’s more, they help companies comply with legislative requirements surrounding health and safety by ensuring the signage they use meets the relevant standards. Combining signage is recommended in the appropriate areas. Fire exit right signs can be displayed in conjunction with other directional fire exit signs as well as floor level signs to help workers and visitors find fire exits in an emergency. Fire exit right signs display information pertaining to the location of the nearest exit in the event of a fire, and can also be combined with fire action signs, which display procedural steps on what to do should you discover a fire or upon hearing the fire alarm. 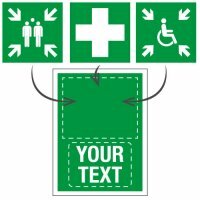 Fire exit right signs are available in a wide range of sizes and materials, including vinyl and polyester. Photoluminescent fire exit right signs, such as our Nite-Glo fire exit running man right signs, are a great solution for areas of low light. These signs are fully compliant with Photoluminescent Safety Products Association (PSPA) Class B, International Maritime Organization (IMO) and German Institute for Standardization (DIN) requirements, as well as with those of British Standards. These signs will stay visible in dark or smoky conditions for up to six hours once activated by a good light source. If your premises are large enough to require more than one or two Nite-Glo fire exit signs, then we have available economic packs of six Nite-Glo fire exit right signs. If you need a fire exit right sign that can be seen from all angles and whose glow is brighter and lasts longer than our Nite-Glo signs, then we have just the answer. Our Xtra-Glo projecting fire exit sign will stay illuminated for over 24 hours with only five minutes of charge. Furthermore, they can be used both indoors and out. We don't just specialise in glow-in-the-dark fire exit signs, we can supply you with our standard rigid plastic signs complete with drill holes, Durasign protective coating or even both. For large venues or outdoor events then an emergency exit right sign should be of a suitable size where it can be clearly seen, for example, from the far end of an exhibition hall. Our exit running man right banner sign is constructed from 500gsm PVC and is supplied with eyelets to enable the banner to be simply secured with cable ties or elastic banner fixings. Various sign fixings are also available to attach your standard-sized safety signs safely and securely to a variety of surfaces, ensuring they will stay put. These fixings include double-sided sign-mounting foam tape, which is resistant to moisture, cold temperatures and chemicals and bonds well with rough surfaces, making it a solid and sturdy adhesive for affixing signs. A popular choice for affixing signage both outdoors and indoors is our SignFix permanent adhesive, a UV and weather-resistant product that can also be used as a sealant due to its strength and sealing abilities. It is ideal for securing signs to damp or uneven surfaces. For more exit signs, take a look at our whole range. If you can’t find the fire exit right sign in the size or with the message that you require, then we can create one that is specific to your needs. Our unique online sign creator tool will enable you to create a fire exit sign that is unique to you and your business in only five simple steps.